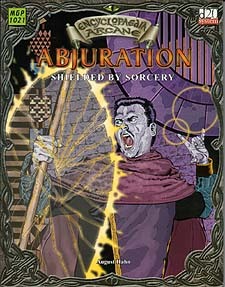 As with anything that seems purely defensive, the school of abjuration is often thought to be weak. This could not be further from the truth. Magic is a powerful force, capable of slaying a healthy warrior with a single word or laying waste to an entire city. Mundane defences are incapable of repelling just force. Only the spells of abjuration offer resistance to this might, which makes abjuration the equal and opposite of offensive magic. Power and effect are not always equally evident. Mages with a speciality in abjuration are generally careful people with a mind for defensive tactics and a strong sense of responsibility. The role of guardian often engenders in them a sense of justice and caution. This sometimes develops to the point of aburers being overbearing in defence of those they consider 'under their protection'. Their magic allows them to protect themselves and others from any hardship that might befall them, even extending that safety into areas most folk would never consider an avenue of attack. Abjurers can guard the mind and the soul, as well as the body.